Last week, we began our discussion of angels, examining their role in Sacred Scripture and even investigating the nine choirs of angels. This week, we focus our attention on the archangels and the guardian angels. Sacred Scripture identifies by name three angels, who are the great messengers of God — Michael, Raphael and Gabriel. They are called archangels because of their important roles in God's plan. St. Michael, whose name means "one who is like God," led the army of angels who cast Satan and the rebellious angels into hell; at the end of time, he will wield the sword of justice to separate the righteous from the evil (cf. Rv. 12:7-0). St. Gabriel, whose name means "strength of God," announced to Mary that she had been chosen as the Mother of the Savior (cf. Lk. 1:26-38). St. Raphael, whose name means "remedy of God," cured the blind man Tobit (cf. Tb. 5). The angels are also our guardians. The Catechism states, "From infancy to death human life is surrounded by their watchful care and intercession" (No. 336). St. Basil (d. 379) asserted, "Beside each believer stands an angel protector and shepherd leading him to life. " Most of us at an early age learned the little prayer to our guardian angel: "Angel of God, my guardian dear, to whom God's love commits me here. Ever this day be at my side, to light, to guard, to rule, to guide. " Moreover, as Catholics, we remember the important role of St. Michael in defending us against Satan and the powers of evil. Toward the end of the nineteenth century, Pope Leo XIII (d. 1903) had a prophetic vision of the coming century of sorrow and war. In this vision, God gave Satan the choice of one century in which to do his worst work. The devil chose this century. So moved was the Holy Father from this vision that he composed the prayer to St. Michael the Archangel, "St. Michael the Archangel, defend us in battle! Be our protection against the wickedness and snares of the devil. May God rebuke him, we humbly pray, and do thou, O Prince of the heavenly host, by the power of God, thrust into Hell Satan and all the other evil spirits who roam about the world seeking the ruin of souls." For many years, this prayer was recited at the end of Mass. About a year ago, our Holy Father at one of his Wednesday audiences made the strong suggestion that the recitation of the prayer be instituted at Mass once again given the great evils we see present in our world — the sins of abortion, euthanasia, terrorism, genocide, and the like. 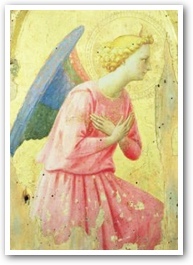 As members of the Church, we are conscious of the angels in our liturgical practices. At Mass, in the Preface before the Eucharistic Prayer' we join with all of the angels and saints to sing the hymn of praise, "Holy, holy, holy.. ." In Eucharistic Prayer I, the priest prays, "Almighty God, we pray that your angel may take this sacrifice to your altar in heaven." In the Final Commendation of the Funeral Liturgy, the priest prays, "May the angels lead you into paradise; may the martyrs come to welcome you and take you to the holy city, the new and eternal Jerusalem." Moreover, we celebrate in our liturgical calendar the Feasts of the Archangels (Sept. 29) and Guardian Angels (Oct. 2). Saunders, Rev. William. "Archangels and Guardian Angels." Arlington Catholic Herald.